The designation "wildlife art" is so deep and wide as to be far too ungainly to handle in a single posting. Fortunately wildlife art (mostly paintings) have proven to be among the most well-received of all the subjects I write about. I think that's because I've broken such art down by content areas--elephants, zebras, giraffes, tigers, etc. In most cases, the number of images I have to pick from are all but overwhelming. I expected the same challenge in selecting skunk art. Not so. For some reason, which is not all that hard to fathom, few artists are willing to take on such a stinkin' subject. To do so requires a daring sense of humor, as seen in the work of Montana artist, Roger Cruwys' Puppy Le Pu (above). (obviously not the artist's real name). 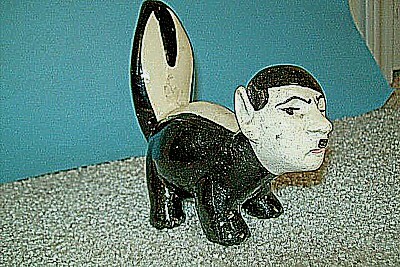 If creating skunk art is daring, far more so is buying it, which would explain why there is so little of such work to be found. Not only that, but so much of it is trite and equally inept, often depending up other elements in the (usual) landscape setting to "carry" the work, as seen above (if all else fails, add a sunset). Even albino skunks often get relegated to supporting roles. And, as with virtually all animal art, the handling of the subject by the artist breaks down into two categories--cutesy and realistic. With skunks, hard as it might be to think in terms of the obnoxious little stinkers being "cute," the vast majority of skunk art is just that. The name "Flower" sent Bambi rolling on the forest floor in gales of laughter. 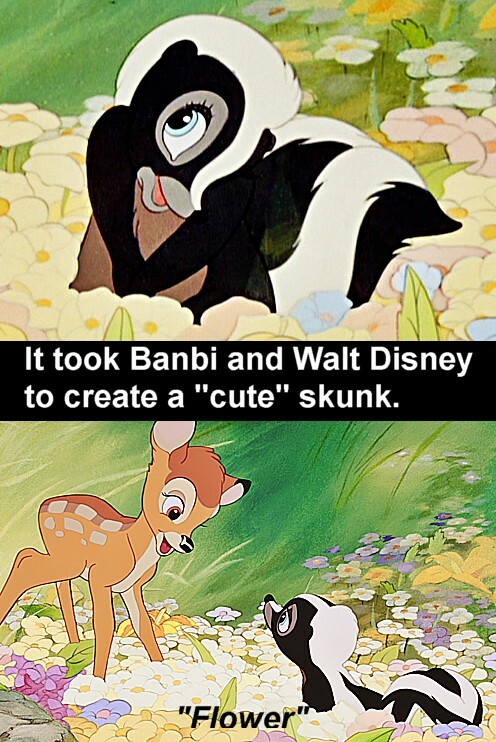 You can blame Walt Disney and his co-conspirator, Bambi, for that (above). Bambi's darling little friend "He can call me Flower if'n he likes, I don't mind," not only set the bar for skunk art but set it quite high. Warner Bros. and their Looney Tunes version, Pepe le Pew, despite the voice of Maurice Chevalier, never quite mea-sured up. On the realistic side, usually paintings of baby animals can be depended upon to engender the "ahhhhh, how sweet," reaction. 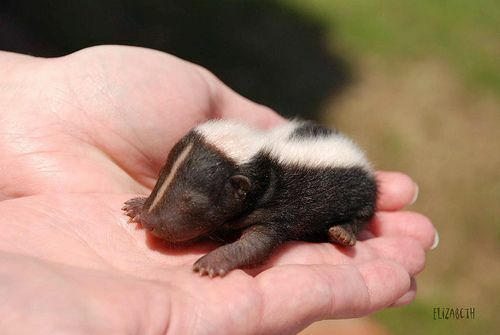 As seen below, baby skunks are not so blessed. 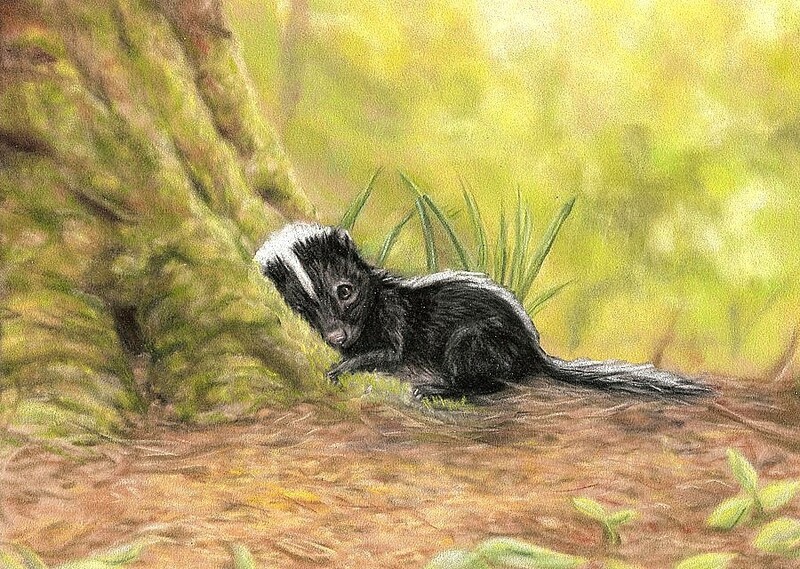 Baby skunks are a perennial part of many forest predators' diet (despite the aftertaste). No mother skunk would ever leave her baby to rest alone like this. If I were to ask you to describe a skunk, you'd probably say they're black with a white stripe down their back. Well, you'd be half right (some skunks have a ginger brownish tint to their fur). 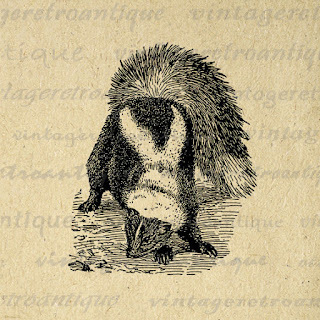 As for their most distinguishing feature, virtually all striped skunks have two white stripes down their back starting just behind the head and continuing through to the end of their tails. Essentially, you'd have to say that skunks are mostly black and white with a black stripe down their back. I found several examples where the artists got it wrong. 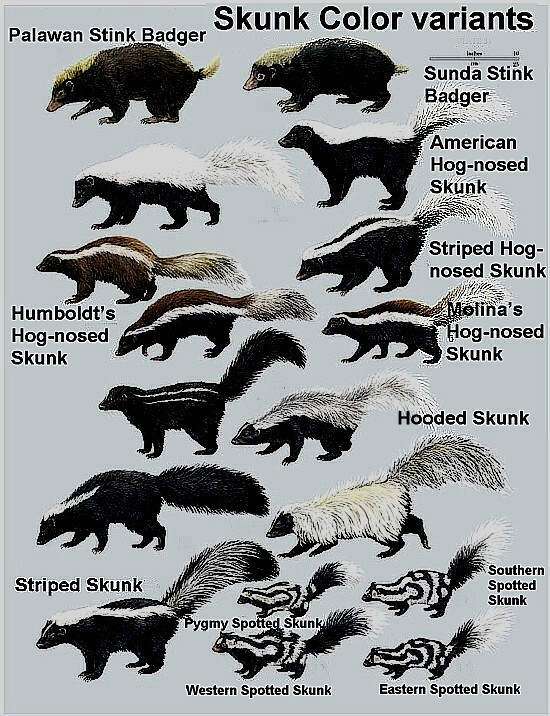 You think all skunks are basically the same? Think again. 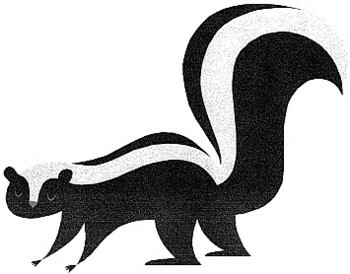 [The skunk] is a low animal, about the size of a little dog or cat. I mention it here, not on account of its excellence, but to make of it a symbol of sin. I have seen three or four of them. [They have] black fur, quite beautiful and shining; and [have] upon [their] back two perfectly white stripes, which join near the neck and tail, making an oval which adds greatly to their grace. But it is so stinking, and casts so foul an odor, that it is unworthy of being called the dog of Pluto [the devil]. No sewer ever smelled so bad. I would not have believed it if I had not smelled it myself. Your heart almost fails you when you approach the animal. Two have been killed in our court[yard], and several days afterward there was such a dreadful odor throughout our house that we could not endure it. I believe the sin smelled by Saint Catherine de Sienne must have had the same vile odor." Skunks are omnivorous, their diet quite seasonal, except in populated areas where their favorite dining spot is the back-alley dumpster. They seem not to mind the smell. Also, they seem to have a sweet tooth, being one of the primary predators of the honey bee. 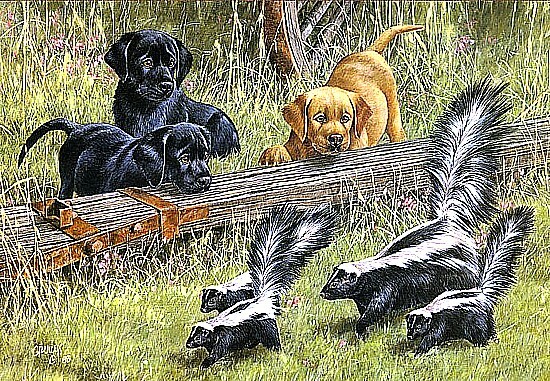 Like felines, the skunk is naturally curious, as depicted by the legendary wildlife artist, Ray Harm (above). Harm is often credited with "inventing" the limited edition print. 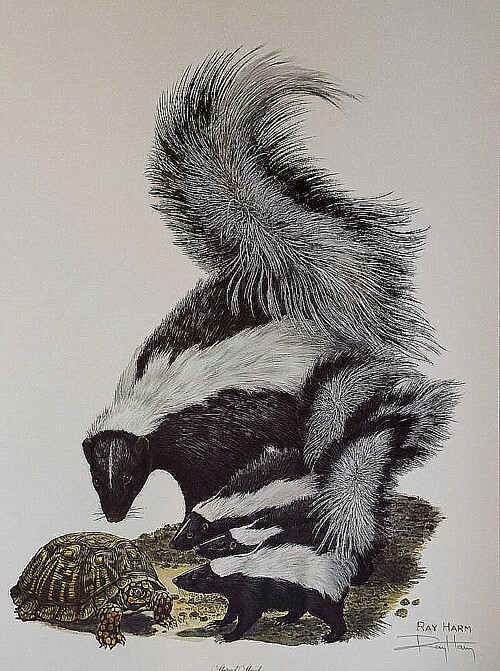 His Striped Skunk is one of the rare examples of skunk art to be found in this media.